Sand spurs (Cenchrus spp.) go by many names, including sandburs, grass burrs and stickers, but whatever you call them, they produce burrs that can be painful. These annual weeds grow throughout the summer in sandy, dry soils in sunny areas. The various species all produce seeds with sharp spines that get stuck in skin, clothes, fur and paws so they can hitch rides and sprout in new areas. Sand spurs are so persistent they've earned a spot on the noxious weed lists in 45 states, but you can take several steps to make your yard sticker-free and barefoot-friendly. Sand spur plants are easy to pull out of damp soil, but wear thick work gloves to protect your skin from the sharp spines. Hand-pulling alone will often control small patches. Mowing large spur-infested areas once or twice a week can help remove the seed heads before they mature and fall to the soil to germinate. Use a clippings catcher on your mower so the seeds don't drop, dry out and becoming little land mines in your grass. Sand spurs thrive in full sun and soils with low nitrogen levels, so following proper watering, fertilizer and mowing practices can help produce grass dense enough to shade out the weeds. Promote grass growth by mowing to a height set at 4 inches and allow your grass to start wilting slightly before giving it no more than 1/2 inch of water. Fertilize your lawn with 1 pound of actual nitrogen -- equal to 4.8 pounds of 21-0-0 ammonium nitrate -- for every 1,000 square feet. Apply the fertilizer late in spring for warm-season grasses, and once in early spring and again in fall to treat cool-season grasses. If sand spurs start sprouting up around ornamental plants, lay down a 2- to 3- inch layer of organic mulching material to smother the weeds and prevent seeds from germinating. Corn gluten meal is a natural pre-emergent herbicide that effectively controls sand spurs if you treat the area before the seeds germinate, which they will once the soil temperature reaches about 52 degrees Fahrenheit. As a bonus, the meal contains about 10 percent nitrogen, which promotes healthy grass. Don't use corn gluten meal in areas where you've recently seeded or want to plant seeds, because the meal stops all seeds from germinating. Treat your lawn with corn gluten meal granules once in early spring and again in late summer. Use a rotary spreader to evenly apply 20 pounds of meal for every 1,000 square feet of lawn. Immediately after application, lightly water area. Repeat this process for two to three years until you no longer have a weed problem. If you don't catch the sand spurs before they start growing, and you have too many to remove by hand, look for a postemergent herbicide that contains MSDMA to eliminate young, actively growing weeds. Many brands offer ready-to-spray formulations that take the guesswork out of mixing and applying herbicide, but follow label instructions carefully. Spray the herbicide on moist soil, but don't water your lawn for at least 24 hours following treatment. 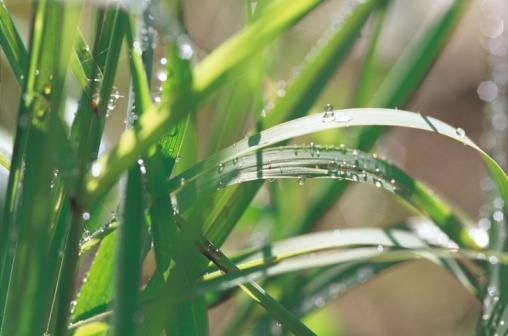 If it doesn't rain within seven days of application, give your lawn at least 1/2 inch of water. Don't mow the area for 48 hours before and after treatments. Before using an MSDMA-based herbicide, make sure your type of grass is listed on the label as safe for use. Avoid using MSDMA on St. Augustine grass (Stenotaphrum secundatum, U.S. Department of Agriculture plant hardiness zones 8 through 10) or centipede grasses (Eremochloa ophiuroides, USDA zones 7 through 8) or you risk killing or damaging your lawn. MSDMA is safe to use on Bermuda grass (Cynodon spp., USDA zones 7 through 10), zoysia grass (Zoysia spp., USDA zones 6 through 9) and buffalo grass (Bouteloua dactyloides, USDA zones 5 through 8), but the chemicals turn the blades yellow temporarily. Bermuda grass is invasive in some locations. Spray herbicides only on calm days so the chemicals won't be blown onto desirable plants. Avoid using grass clippings treated with herbicide as mulch in vegetable or flower gardens. Reduce your risk of chemical exposure by putting on waterproof gloves, a face mask, protective clothing and goggles when mixing or spraying herbicides. Keep people and pets out of the treatment area until the spray completely dries.